I like to document all our network shares. I have bought Network Scanner and have a couple of questions. I login to a workstation on the LAN with the credentials of the user group I like to check. I have a portable SoftPerfect Net Scanner on a USB. 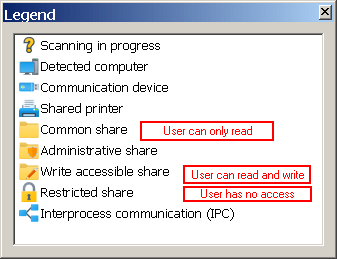 What is the best settings for the scanner if I only like to show what resources on the LAN this user can access? Most important is to find out what network shares are accessible. What does the tick box "Enable security and user permission scan" actually do? Is it a better option to logon to the workstation as LAN administrator and use the Authentication option in Shares to set the user I like to check? It is better to logon as the user whose access rights you want to check, like you did. Then on the Shares tab tick Scan for shared resources and Check for write access. the user cannot access the share and cannot see files in it. The other option you mentioned, Enable security and user permission scan, works best under a domain admin account and will list what users and groups can read and write each share, as well as what the Everyone group can do.